Just before Tyrone “TJ” Adair was gunned down just outside the patio at Cold Crush, the atmosphere was like any other warm Sunday evening on “The Block,” the nickname given to the 2700 block of Larimer. The dance-club and art-bar was packed with Denver hip-hop fans, who had been loyally filling Cold Crush for years, as it was one of the few venues in the city where this culture was given a little room to breathe. A sort of hip-hop Mecca for the city, Cold Crush synergized an otherwise splintered community; here slam poets, gangsta emcees and radical activists could all come together under the holy gospel of breakbeats. An altercation between Adair and an unnamed guest began on the patio, then quickly spilled out onto the sidewalk, ending with Adair dead of a gunshot wound. This tragic death would go on to divide this once solid community, leaving the future of Denver’s favorite hip-hop club hanging in the balance. Cold Crush became mired in troubles with the City Attorney in the wake of the murder investigation, leading to the controversial closing of the venue by officials and neighbors who considered it a “public nuisance.” Subsequent news stories highlighted the growing divide between hip-hop and the owners of Denver’s music venues (who often associated the genre with guns and drugs, and were reluctant to host concerts). Reporters from various news outlets called me directly, totally unclear about how to cover Cold Crush being shut down. I was a resource because I’m a member of the hip-hop community, and because I’ve become a quasi-liaison between the press and this scene since I published my first rap review in Denver Westword in 2009. They had no idea who to talk to get the full story of Adair’s presence and impact on the hip-hop community, and so most of the coverage was taken from a bird’s eye view. Writers who had never stepped foot in the location were covering the community rally in support of Cold Crush, lifting quotes that were published without attribution and circling the candlelight vigils like vultures hovering over their prey. I answered hurried emails from multiple writers who were doing the thing reporters do: crunching numbers, attempting to get the City Attorney on the phone, and doing their best to understand a culture alien to them, but which many of us live on the daily. It wasn’t until the writing of this story that I’ve given my formal opinion about Cold Crush and its importance to the hip-hop community. People like to mention Meadowlark and Larimer Lounge as the locations that first created a music scene in the neighborhood, and that’s true with some segments of the populous, but for hip hop fans the opening of Cold Crush was a Denver game-changer: We now had a place to go that was a respite from the racist undertones that existed in other venues, where rap is tolerated but never welcomed. While many of us reeled from Adair’s murder and the trauma of being in a place where gunshots sent unexpected partygoers scattering, talent buyers and promoters for other venues patted themselves on the back in disgusting displays of “not in our bar, and not on my watch” smugness. One talent buyer told me directly they couldn’t book anything that was considered “rap or thug.” Already exhausted from these descriptions, it wasn’t worth it to debate anyone over it or try and explain the nuanced racism of this thinking to other reporters. And besides, Cold Crush was being shut down and labeled as a public nuisance, so we had bigger fish to fry. Additionally, hip-hop as the red-headed stepchild of the music scene was nothing new. Performers have been fighting and vying for a place of legitimacy in music scenes since the original Cold Crush Brothers (for whom the Denver club is named) came on the scene in 1970s Bronx. For decades rap has been seen as a commodified source of revenue, but rarely afforded a viable location, a consistent cathedral where the scene can develop its own expression and artful revolution. While Cold Crush owner Brian Mathenge (a hard numbers genius with a gruff, but generous personality) scrambled with his attorneys and staff to figure out a plan, the community got organized with a viral video dedicated to the unity found at Cold Crush. These efforts, combined with an acquiescence to program changes (no more dancing on the bar; ID scanners and pat-downs without exception) proved enough for the city to let Cold Crush open their doors once again. News trucks lined the streets for the first few days of the re-open, but none of the writers who crunched numbers, or asked for connections to Adair’s friends and families, returned to the bar. That was to be expected, but what surprised me was the absence of so many Cold Crush regulars, who couldn’t reconcile partying steps away from where Adair took his last breath, and began to associate the once-treasured club with gunshots and flashing police lights. In the months since Cold Crush’s return, the club has struggled to return to its former status as the hip hop Mecca of Denver. It’s hard to determine whether the central idea about the recent troubles from Cold Crush are about the fickle customers, or the nature with which hip-hop is treated in growing cities. Part of me wants to say it’s the spineless guests who don’t know how to stick it out when the chips are down, who made it hard for the club to reopen with its same vigor after Adair’s murder. Part of me wants to rail at the critics who are so hard on hip-hop but know nothing about the culture, and whose critical, racially inflammatory statements about Cold Crush did more harm than help. Still yet, part of me wants to blame the press and the obsession with tragic stories about black bodies, while ignoring the the years artistic beauty and community strengthening that happened at Cold Crush. I want people to understand the importance of having a place where hip-hop music is not only played but celebrated. Where the history of our culture graces the walls and the murals outside, and how important it is to have a black-owned business in an increasingly gentrifying neighborhood. Perhaps the troubles Cold Crush experienced are a study in human nature. A penchant for joyous devotion during the good times and reactionary conservatism during the bad. Or maybe it’s as simple as folks needing to work through the changes at their own pace. At any rate, the growing population in Denver continues to usher in more energies over time. New bodies have taken over the seats at the bar and some of the regulars have been lured back by the sounds of their favorite deejays paired with strongly poured spirits. Shortly after completing the first draft of this essay, the police announced they’d made an arrest in Adair’s murder (though naming him in these pages is not a priority of mine), and Cold Crush was again in the headlines. Unlike the weeks after that fateful night in October, though, the collective conversation feels more like a sigh of relief than a rallying cry for all hip-hop refugees to finally return home. Ru Johnson is a writer and founder of Roux Black Consulting who lives in Denver. 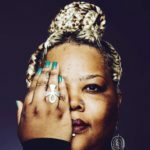 Her writing has appeared in Denver Westword and The Denver Post with entertainment and hip-hop as the focus. A music lover and avid nail polish enthusiast, Ru believes art is the revolution and that if you stay ready, you won’t have to get ready.